In Asia, the prevalence of liver diseases is high. 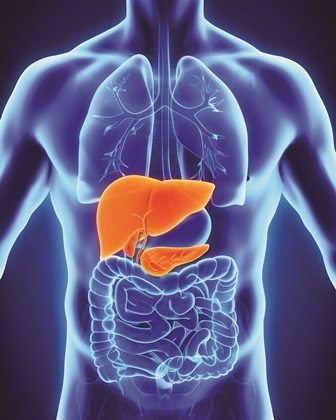 Conditions like jaundice, fatty liver associated with obesity, high alcohol consumption and metabolic conditions like high cholesterol and diabetes, to liver cirrhosis and cancer can all cause damage to the body’s Hepato-Pancreato-Biliary (HPB) system – yet few understand it importance. Made up of the liver, pancreas, bile ducts and gallbladder, each organ is intrinsically related, and they are all essential to the body’s digestive system. Taking care of your HPB system through early detection is vital to empower patients to seek the right care. Tasked with necessary bodily functions that include processing digested food from the intestine to controlling levels of fats, amino acids and glucose in the blood, combating infections in the body clearing the blood of particles and infections, neutralising and destroying drugs and toxins, strong iron, vitamins and other essential chemicals, breaking down food to turn it into energy and manufacturing bile which aids in fat digestion to breaking down food to turn it into energy, the HPB system is indeed complex but very important. Like all other bodily functions, the HPB system is also susceptible to disorders and diseases. Related diseases triggered by viral, bacterial or parasitic infections, neoplasia, toxic chemicals, alcohol consumption, poor nutrition, metabolic disorders and even cardiac failure can lead to severe conditions. Diseases of the liver, pancreas, gallbladder and biliary system are relatively common and frequently require surgical treatment for recovery and good long-term outcome. The liver is a vital organ, without which the tissues of the body would quickly die from lack of energy and nutrients. It performs many essential functions related to digestion, metabolism, immunity and the storage of nutrients within the body. It is also the only organ in the body that has an incredible capacity for regeneration of dead or damaged tissues and it is capable of growing quickly to restore its normal size and function. Fatty liver and hepatitis B are the two most common liver diseases in Singapore. A lifestyle-related liver condition, fatty liver, which affects approximately 15% of the population, could be the result of a sedentary lifestyle, inadequate activities and eating too much leading to an increase in body mass index (BMI). The risk factor of diabetes also negatively impacts the condition. Hepatitis B, which is a disease characterised by the inflammation of the liver. The disease can progress to fibrosis (scarring) and cirrhosis or liver cancer. Since the prescription of a universal vaccination against hepatitis B, there has been a significant drop in incidences. To determine the health of the liver, by running a liver function test or a group of blood tests to detect inflammation and damage to the liver, even if there is no significant sign of liver discomfort, in particular for individuals who belong to the high-risk group – those with bad food habits, who lead sedentary lifestyles, with high BMI, diabetic patients, as well as individuals with family members who have liver conditions or are carriers of hepatitis B. Once any liver disorder is detected from the blood tests, an ultrasound and further blood test will be prescribed to determine how advanced the condition is. Occasionally, there any be no answer from the blood tests by which time, the doctor may opt for minimally-invasive biopsy to draw samples from the liver cells. After the liver condition has been determined, the next step is to prescribe treatment to prevent further injury to the liver, as well as to reduce the risk of downstream conditions. Fatty liver can be prevented from escalation with oral medication and lifestyle modification. Patients who are motivated to reduce calorie intake and exercise can reverse the liver condition. In fact, lifestyle changes are often more effective than medication. In the case of hepatitis B, if the virus is active and there is ongoing injury to the liver, treatment is necessary and this comes in the form of antiviral oral medication. Thereafter, regular blood tests will be done to determine if the condition is under control. Surgery becomes necessary in two situations, when liver disease leads to liver failure, usually at end stage liver cirrhosis in which case a transplant is needed and if liver cirrhosis leads to liver cancer, the operation only removes cancer and leaves the remaining functioning liver. A liver transplantation is necessary for any individual with liver failure. In Asia, the prevalence of liver diseases like liver cancer is high, and there is an increasing demand for liver transplantation for patient with end-stage liver disease, not to mention a worldwide shortage of cadaveric (non-living) livers with a long waiting list in every country. Hence, Living Donor Liver Transplant (LDLT) has become an effective option, particularly for those with acute liver failure and liver cancers like hepatocellular carcinoma (HCC), the most common type of liver cancer. LDLT is a procedure that involves a living donor who is willing to give a portion of his or her liver to a family member or close friend in need of a liver transplant. For patients suffering with rapidly progressive liver disease, waiting for a deceased donor liver is often not ideal as that can take a long time. Without LDLT, such patients can develop fatal complications. One of the biggest advantages of LDLT over deceased donor liver transplantation (DDLT) is that the doctors can schedule the patient’s procedure. Thus, patients in a compromised medical condition can be optimized prior to transplant surgery in order to achieve better outcomes. A dedicated inpatient ward & ICU for liver patients. Established in 1994, we are a leading center that treats liver, pancreas and bile duct diseases in both adult and paediatric patients. Based at the Gleneagles Hospital where it provides the outpatient services, we also co-manages the dedicated in-patient liver ward and ICU, known as Parkway Asian Transplant Unit (PATU). The center is designed to provide patients with comprehensive and seamless liver care including liver cirrhosis treatment, liver dialysis, Hepatitis C treatment and Hepatitis A and B vaccines. PATU’s excellent clinical outcomes have been internationally recognized, making the unit one of Singapore’s leading medical assets. Led by Dr. Tan Kai Chah, a renowned liver surgeon specializing in liver transplantation, the team comprises of Dr. Lee Kang Hoe, senior consultant and multidisciplinary team of doctors, nurses and allied healthcare professionals. Having performed the first living donor liver transplantation in 2002, we have gone on to successfully conduct more than 240 LDLTs – a milestone for Asia’s first private transplant centre. It is now one of the largest and most experienced centres performing such a procedure. The key to success has been a well-trained and experienced team in both ICU and general ward settings. The liver unit has also become one of the top centres in the world for managing liver failure patients before liver transplant. We have been successful in bridging these patients to their surgery by utilizing state of the art liver dialysis support for such critically ill patients. Our experience to date has been one of the largest in the world in managing such complex cases successfully. We uses advanced German technology from MeVis Distant Services (MDS). It is a precise tool enabling the surgeon to perform the operation on the liver donor with utmost safety and confidence, this technology allows the doctors to reconstruct the liver anatomy of the donor accurately from CT scans. The data from the CT scan of the donor is uploaded to MDS, where a team of technicians and radiologist will translate the data to depict the vascular anatomy and parenchymal volume to determine the suitability of the proposed liver graft for the recipient. We were one of the first medical centres in Southeast Asia to use such technology regularly and also a regional leader in the usage of various liver dialysis machines, which help treat patients with liver failure and act as a “bridge” to transplantation surgery. One of the main drawbacks of LDLT is the potential for complications or even death of the donor. There is also the difficulty of finding a donor whose blood group is compatible with the recipient and is fit (physically and mentally) to undergo surgery. In Singapore, donors tend to be next of kin of the recipient or close associates. Potential donors are required to consult with our specialist to be made fully aware of the risks of the surgery. The pancreas is a large gland behind the stomach that releases powerful digestive enzymes into the small intestine to aid the digestion of food. It also releases the hormones insulin and glucagon into the bloodstream. These hormones help the body control how it uses food for energy. Inflammation of the pancreas can happen when the digestive enzymes are activated before they are released into the small intestine which then attacks the pancreas. Pancreatic diseases can be categorized into benign and malignant causes. There are many benign pancreatic diseases such as pancreatitis (acute and chronic), most pancreatic cysts, some pancreatic neuroendocrine tumours and autoimmune pancreatitis to name the major ones. While the causes for pancreatic cysts, pancreatic neuroendocrine tumours, and autoimmune pancreatitis are not entirely clear, it is commonly believed that acute pancreatitis is usually caused by gallstones or alcohol abuse/ingestion. Pancreatitis caused by gallstones will require gallbladder surgery to prevent subsequent abuse and may require surgery to relieve abdominal pain in severe cases. Autoimmune pancreatitis, which can sometimes mimic pancreatic cancer, is thought to be caused by chronic alcohol abuse and may require surgery to relieve abdominal pain in severe cases. Autoimmune pancreatitis, which can sometimes mimic pancreatic cancer, is thought to be caused by the body’s immune system attacking the pancreas and can be treated with medication. With more people turning to regular health screening, coupled with the prevalent use of medical imaging such as ultrasound and CT, there is an increased incidence of early detection of pancreatic cysts. Pancreatic cysts can be detected early, but this will require an ultrasound or CT scan. Blood tests are not reliable markers for most pancreatic tumours or cysts. To determine the nature of pancreatic cysts, patients may undergo endoscopic ultrasound. This will have the advantage of sampling the cyst fluid for analysis (with fine-needle aspiration), helping us determine the cancer frisk and diagnosing the various types of pancreatic cysts. Once the nature of the cyst and its risk for malignancy (or cancer) have been determined, the doctor will then advise how best to manage the cyst. Typically, for low-risk cyssts, surveillance by a pancreatic doctor will suffice. However, in the case of high risk cysts, surgery is the treatment of choice to eradicate the problem, as well as, to avoid the possibility of the cyst becoming malignant in the future. Pancreatic cancers are malignant, and they can arise in the head of the pancreas or the body/tail of the pancreas. To date, there is no reliable marker for early detection of pancreatic cancer, however, we are aware that some pancreatic cysts are at risk of becoming pancreatic cancer. Hence, the formal evaluation of pancreatic cysts to determine if these cysts are at high risk for pancreatic cancer will be important. Surgery is the treatment of choice once pancreatic cancer is diagnosed. Whipple surgery or the removal of the pancreatic head is recommended if cancer occurs in the head of the pancreas. Complications occur in about 30% of Whipple surgery, with most being minor ones such as infection, wound problems, or delayed bowel recovery. Major complications would include bleeding or pancreatic leak. If a tumour is located in the body or tail of the pancreas, distal pancreatectomy or surgical resection of the body and tail of the pancreas will be performed. And if the cancer is detected early, this surgery can be performed laparoscopically otherwise known as a minimally-invasive surgery performed without long incisions. With a 10% to 15% rate of complication, of which most are minor complications recovery is expected to be relatively quick and with a significantly smaller scar. Adjuvant chemotherapy after surgery helps in lowering relapse rate for pancreatic cancer. The majority of patients recover well from surgery and will maintain normal digestive function after pancreatic surgery. Post-surgery downtime is approximately three to six weeks, depending on the type of surgery performed. Some patients can experience mild abdominal discomfort after surgery but assure that the condition it will improve with time. A small minority of about 10% to 20% can develop diabetes after pancreatic surgery, depending on the complexity and type of surgery performed. The biliary tract is made up of the gallbladder and bile ducts. The gallbladder is a pouch that connects to the mid-portion of the main bile duct, acting as a reservoir for bile while it is not being used for digestion. 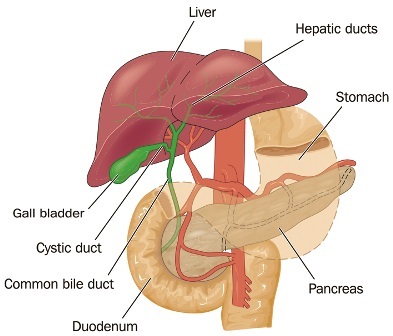 The main function of the bile duct is to transport bile, a liquid produced by the liver to the intestine where it helps with the digestion of food. Bile duct stones are caused by gallstones that may have fallen out into the main bile duct. And in rare instances, stones may form in the bile duct instead of the gallbladder. The risk factors for gallstone formation include obesity, female gender, pregnancy, high-fat diet and family history. Patients with this condition may experience symptoms of infection (fever, right upper abdominal pain, sweats and chills) as most stones contain bacteria that may lead to infection of the blocked bile flow. Gallstones in the gallbladder may be detected by an ultrasound scan of the abdomen. Gallstones are very common in the general populations and the presence of the gallstones without symptoms usually does not require treatment. Stones in the bile duct, however, require medical attention. Stones in the bile duct may be removed using a special endoscope called endoscopic retrograde cholangiopancreatography (ERCP). Introduced through the mouth, a flexible tube with a light and camera goes into the duodenum where the bile duct is to remove the stones. If the ERCP is unsuccessful in removing the stones, a radiological procedure is suggested for percutaneous transhepatic cholangiogram to be performed where a catheter is inserted through the liver into the bile ducts for the visualization of the biliary tract. Another option is to perform a surgical removal of the bile duct stones. In order for bile duct stones to be removed from the gallbladder, the gallbladder will be surgically removed, often via key-hole or laparoscopic technique, to prevent recurrent problems. Bile duct cancer, or cancer of the wall of the bile duct, may occur along the course of the ducts. Its risk factors include parasitic infection, primary sclerosing cholangitis (autoimmune bile duct inflammation), bile duct cysts and chronic bile duct stones. Patients with this condition may complain of poor appetite, weight loss and fatigue. Such cancer is difficult to detect at its infancy and usually has no symptoms. It may cause an elevation of tumour markers but because tumour markers are also commonly raised in noncancerous conditions, it is often difficult to identify such cancer. Surgical removal is the only chance for cure in bile duct cancer. Surgery is only possible if the patient is diagnosed at an early stage before the cancer has spread. The type of surgery is dependent on the location of the bile duct cancer and it usually involves the removal of the bile ducts with part of the liver or pancreas. After recovery from surgery, it is often recommended that patients undergo chemotherapy and/or radiotherapy. If surgery is not possible, chemotherapy may prolong the patient’s survival. AALC offers both inpatient and outpatient facilities, as well as services for international patients, to provide comprehensive and seamless patient care.